Enjoying time together unplugged - two sisters make their way through Sri Lanka by tuk tuk and train. Let me start off by saying my sister is my favorite travel buddy. Maybe it is because she goes along with whatever I want to do or maybe because I just thoroughly enjoy her wit and sense for adventure. Whatever the case when we were both living in Asia, she in Malaysia, I in Singapore we made the journey to Sri Lanka. 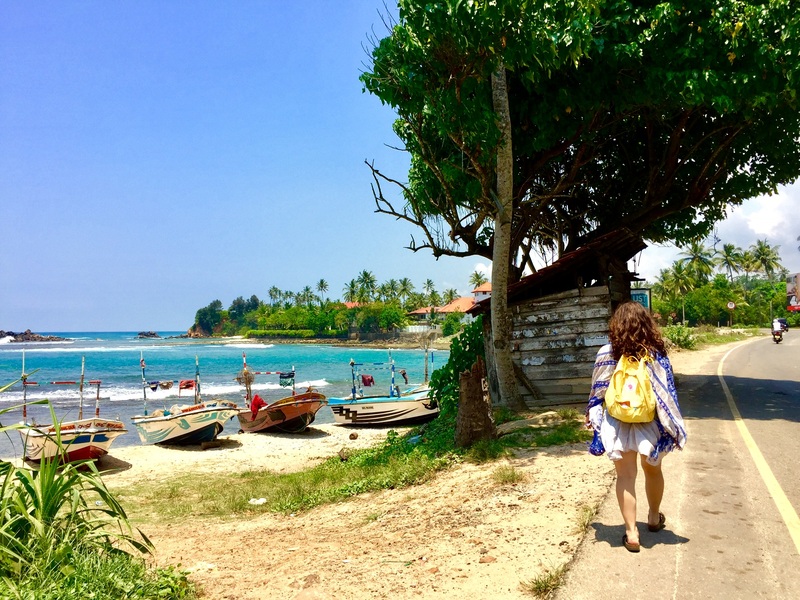 Now if you want pure, unadulterated sunshine, Sri Lankan’s southern coast (specifically the town of Ahangama) is where you need to go. now. right now. this cannot wait. I immediately felt like I was in a dream upon setting my eyes on the outer worldly beauty that is Sri Lanka’s southern coast. The waves called to me as I rode mesmerized the entire 4 (yes 4 hours in a Tuk Tuk) drive to our Air Bnb, my head stuck out the small window like a dog, with absolutely no cares. Stopping only to pick up fresh coconuts and sneak a photo of the stilt fisherman (they now do this as solely a tourist attraction and will hunt you down and make you pay if they catch you taking a photo) we reached a beach that can only exist in your wildest dreams with the softest sand known to man that felt like walking on a tempur-pedic mattress. Heading straight to the water, fresh coconut in hand, I glided then floated onto the surface of the most gentle water imaginable, all the way thinking I must be in a dream. Somehow we awoke from the dream and made our way onto a train that chugged through gloriously green tea plantations. Again, like a dog, we stuck our heads out of the window to breathe in the intoxicating scent of the tea leaves as we headed further into the countryside. Waking up early we – my sister – decided to hike Adams Peak, home to a sacred Hindu site. In the darkness, on the climb up, she waited patiently for me to catch up, breathing heavily as I approached, before taking the next steps at a pace I couldn’t even begin to fathom. Reaching the top to watch the sunrise, we held each other fiercely as the sun rose, in shock over where we were and how incredibly cold it was. But as the sun rose and the sky turned from one bright shade of pink to the next, the 5,000 steps we took to get up there seemed a lifetime away. Making our way down it was time to safari. Sri Lankan sunrise safari’s in Udawalawe National Park are a certain type of magic. If you have an experienced driver who takes you away from the trail of backpackers in Range Rovers you are able to be fully immersed in the picturesque natural surroundings where you will find an abundance of elephants, peacocks and natural light which ads an air of mysticism to the whole experience. Sri Lanka is an incredibly welcoming country with some of the nicest people I have ever had the pleasure of encountering. Should you decide to go check out Kairos for details on where to go and what to see.